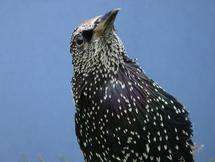 (PhysOrg.com) -- Research into decision-making by European starlings (Sturnus vulgaris) may help to explain why many animals, including humans, sometimes exhibit irrational preferences. A study by Oxford University scientists in which starlings pecked on different coloured keys to gain a food reward shows that the birds pay too much attention to context: this makes them vulnerable to the sort of tricks that marketing specialists use to try to make human shoppers choose one product over another. A report of the research is published in this weeks Science. • Budget supermarket Starbuy sells a range of tomatoes that includes Redgold as its highest quality option. Its rival Poshchoice sells a superior range that includes Goldquest, a variety superior to Redgold but at the bottom of Poshchoices upmarket range. • Because other tomato alternatives are available in each supermarket, on regular shopping trips shoppers experience a positive feeling when they see Redgold (Ill take it, its the best around) and a negative one towards Goldquest (Ill see if theres a better one). • On rare occasions where both varieties are presented side by side, shoppers choices will be influenced by these emotional memories, upping the preference for the manifestly inferior Redgold, because it is remembered as a winner. "Such examples of irrational behavior are often quoted in studies of human behavioural economics, but the reasons why people may be designed to make such irrational choices are rarely addressed," said Dr. Esteban Freidin, from whose DPhil dissertation this study originates. "We are evolutionary-minded scientists, and for us the consequences of behavior must play a role in the evolution (and design) of the underlying psychology. If decision-makers make systematically bad decisions, we want to understand why, said Professor Alex Kacelnik, Freidins supervisor and head of the Behavioral Ecology Research Group in Oxford Universitys Department of Zoology. In an experiment involving eight European starlings Freidin and Kacelnik tested whether giving these decision-makers additional, truthful, information about the typical context of each alternative could harm choice performance (a phenomenon sometimes called the less is more effect, because ignorance seems to improve results). They manipulated the presence or absence of reminders of the normal context of each item, and wondered whether such reminders would improve or harm the rationality of the starlings choices: In their shopping metaphor, this experimental manipulation would be equivalent to adding to every box of tomatoes the supermarkets logos (for example a label reading: Products of Starbuy/Poshchoice). They reasoned that context information is irrelevant to the choice between two simultaneous alternatives, but may influence preferences because it brings up the memory for the emotional impact of meeting each option in its normal context. This is exactly what they found: the starlings (which were pecking at coloured keys for food rather than buying tomatoes) were trained with two options in different contexts. In each context one option was better and the other worse than another alternative present at the time. To implement the logos manipulation, they divided the birds in two groups. In one group (context signalled) a signal identified in which context each presentation took place. In the other (context unsignalled) the birds could only infer the context from the options encountered. When the birds were presented with the two target options simultaneously, the context-signalled group made more wrong choices than the context-unsignalled one, confirming that the addition of truthful information can, ironically, make decision-makers perform worse. The results were reversed, however, when the starlings were presented with only one option at a time, and had to decide whether to take it or leave it to search for better alternatives. In the supermarket metaphor, this would mean that enhanced context information is good for shoppers usual circumstances (if you find the best tomato this shop sells, take it; if you find the worst search for an alternative). However, being reminded of these context-dependent circumstances brings to the fore feelings that can be harmful in the unusual cases where the two target options are simultaneously available: here all that matters are the differences between the two options. By responding to the context the starlings might have been economically irrational, but they were ecologically rational, because they did well in frequently occurring situations while paying a cost in rare ones. The authors argue that decision processes reflect organisms adaptations to their circumstances, and that for most animals this probably involves maximising their performance in sequential encounters (of the take-it-or-skip-it kind) rather than side-by-side simultaneous ones (of the take-either-of-these kind). In the former, being influenced by the context helps to make better decisions, while in the latter, the additional information adds confusing and irrelevant noise. Dr. Freidin said: "We use theory developed to understand foraging behaviour of animals to expose general principles of choice." Professor Kacelnik added: "A successful science of decision-making cannot be based exclusively on the psychology of decisions or on the evolution of this psychology: it needs both. We illustrate this by combining animal behaviour experiments with economic analyses of human behavior." More information: A report of the research, entitled Rational choice, context-dependence and the value of information in European starlings (Sturnus vulgaris), is published in Science. How do we choose what we put in our shopping basket?